In this age of the email attachment and of the “duplicate” and “save as” commands, we’ve come to take copies for granted. But the quest for a way easily to make/keep duplicates of correspondence and records without transcribing them has a long history: most readers will be old enough to remember the days when Xerox machines– introduced in 1959**– were the duplicators of choice; and some, the era of the carbon copy. But while xerography ruled for around 50 years, carbon paper held sway for over 100. The first version of carbon paper was patented by Ralph Wedgwood—an estranged member of the famous Wedgwood pottery family—in 1806. The paper was the central component of Wedgwood’s “Manifold Stylographic Writer,” which was originally meant to aid the blind in writing (through the addition of thin metal wires to guide in forming words along lines), but was soon used primarily as a copying device. 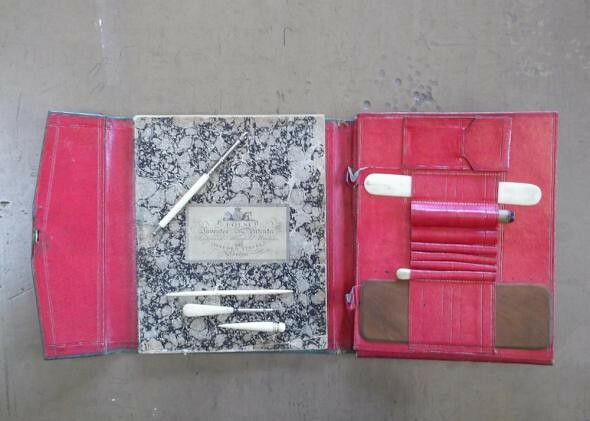 Wedgwood wasn’t the only manufacturer of manifold writers; the portable (approx. 8.5 x 10 in) leather wallet above includes a label naming “inventor and patentee” F. Folsch. Early adopters were mixed in their reviews. In the end, wide adoption of carbon paper came in the 1870s with the introduction of typewriting (and the development of better-smelling ink). Read more at Slate in Nora Wilkinson’s “The Nifty, Portable Copying Technology Used by Early-19th-Century Letter-Writers,” and even more in her longer post on the subject on the Bodleian Library’s Conveyor blog. ** The Xerox machine was the much sharper competitor of- and, with it’s technological copycats, ultimately replacement for– the first office copiers, introduced in 195o (main among them, 3M’s Therma-Fax machine). 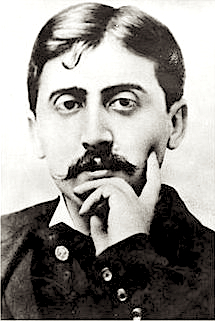 As we savor sharing, we might send nostalgic birthday greetings to that most exquisite of (self-)copiers, Valentin Louis Georges Eugène Marcel Proust; he was born on this date in 1871. Proust spent the last three years of his life confined to his cork-lined bedroom, working to complete what Somerset Maugham called the “greatest fiction to date,” the seven-volume novel A la Recherche de Temps Perdu (Remembrance of Things Past, or as more recently translated, In Search of Lost Time). All the greatest things we know have come to us from neurotics. 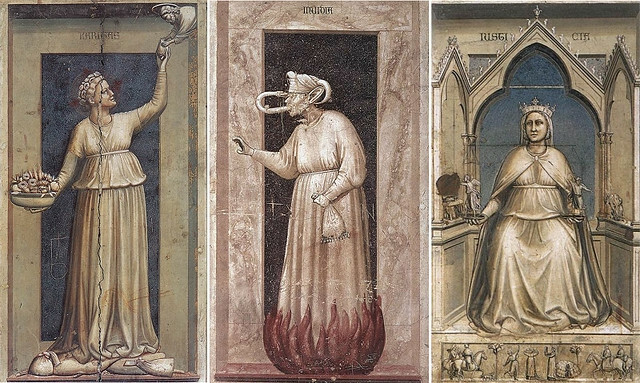 It is they and they only who have founded religions and created great works of art. Never will the world be conscious of how much it owes to them, nor above all of what they have suffered in order to bestow their gifts on it. Throughout his seven-volume A la recherche du temps perdu– in his attempts to describe scenes and emotions, to help elucidate a point, to sharpen an image, or simply as a subject in itself – Proust would time and again turn to the visual arts. 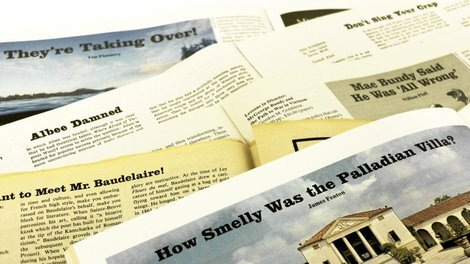 As a celebration of the centennial of its publication, Public Domain Review has put together a few highlights of Proust’s many mentions of artworks to be found in the first volume, Swann’s Way, in which the narrator uses the art to “illustrate” his experiences growing up, participating in society, falling in love– and indeed, learning about art. 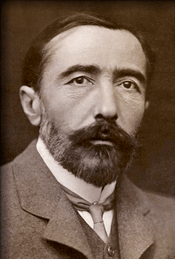 As we manipulate our madeleines, we might send dark, but heartfelt birthday greetings to Proust’s literary contemporary Józef Teodor Konrad Korzeniowski, or as he’s better known to English readers, Joesph Conrad; he was born on this date in 1857. An early modernist who spoke and wrote in three languages (his native Polish, French, and English), he imported a non-English diction and tragic sense to his work, which included Heart of Darkness, Lord Jim, Nostromo, 17 other novels, and dozens of short stories. A success in his own time, Conrad’s influence grew; he’s been cited as a formative influence on writers including D. H. Lawrence, F. Scott Fitzgerald, William Faulkner, Ernest Hemingway, George Orwell, Graham Greene, Malcolm Lowry, William Golding, William S. Burroughs, Joseph Heller, Italo Calvino, Gabriel García Márquez, J. G. Ballard, John le Carré, V.S. Naipaul, Philip Roth, Hunter S. Thompson, J.M. Coetzee, and Salman Rushdie. … and exclaimed, and teased with indefinite antecedents– and just generally delighted. As we tip our hats to the tease, we might spare a thought for François-Anatole Thibault; he died on this date in 1924. 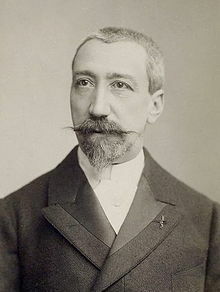 Better known by his pen name, Anatole France, he was the poet, journalist, and novelist considered the ultimate French “man of letters” of his time. A member of the Académie Française and winner of the Nobel Prize for Literature (1921), France was active in affairs of the state– perhaps most prominently as an ally of Zola’s in the Dreyfus Affair. But he’s in your correspondent”s Pantheon as the model for narrator Marcel’s literary idol Bergotte in Proust’s In Search of Lost Time (or, as your correspondent knew it, Remembrance of Things Past). As many as a million young people. 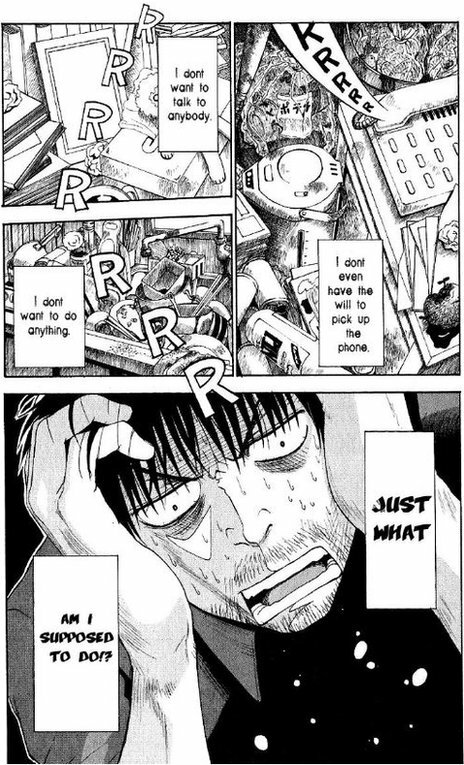 mostly young men, in Japan are thought to have become hikikomori— to have holed up in their homes, sometimes for decades at a time. As we burrow under our blankets, we might slip birthday greetings under the bedroom door of that most-famous literary shut-in, Valentin Louis Georges Eugène Marcel Proust; he was born on this date in 1871. 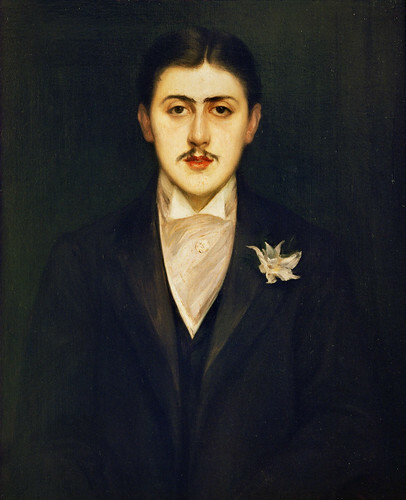 Proust spent the last three years of his life confined to his cork-lined bedroom, working to complete what Somerset Maugham called the “greatest fiction to date,” the seven-volume novel A la Recherche de Temps Perdu (Remembrance of Things Past, or as more recently translated, In Search of Lost Time). As we feel better about ourselves, we might spare a thought– well actually, lots of thoughts– for Marcel Proust; he died on this date in 1922. 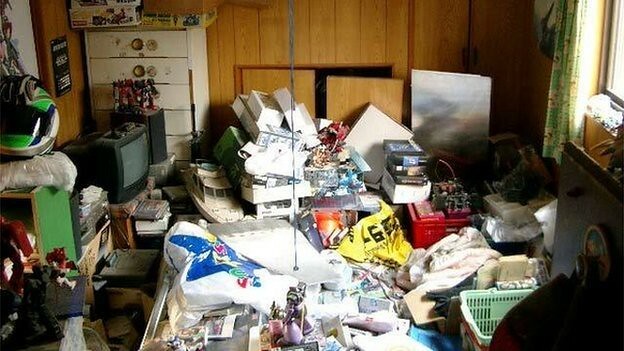 He spent the last three years of his life in ill health, confined to his cork-lined bedroom, struggling to finish his masterpiece, À la recherche du temps perdu (Remembrance of Things Past). He died before he was able to complete his revision of the drafts and proofs of the final volumes, the last three of which were published posthumously and edited by his brother, Robert. 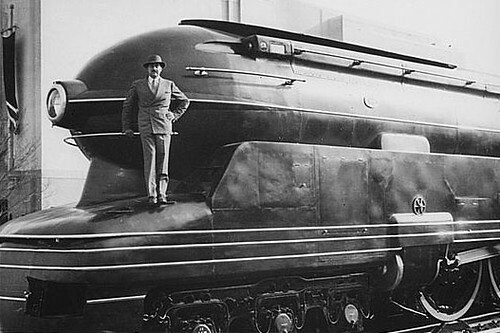 Still, Graham Greene called Proust the “greatest novelist of the 20th century,” and W. Somerset Maugham called the novel the “greatest fiction to date.” Indeed.